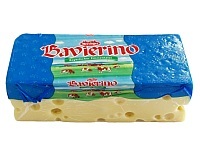 Emmentaler or Emmental is a yellow, medium-hard Swiss cheese that originated in the area around Emmental, Switzerland. It has a savoury, but mild taste. This particular brand is manufactured in Germany and produced by Zott. Unit barcode: Varies as it’s weighted bar code.